Common sense and a knowledge of history both favor allowing “new blood” into a society, particularly those who will work hard, obey the laws, increase productivity, and increase the moral fiber of that society. Immigration has been good for the United States. All of us currently living here—including the Native Americans—are descendants of immigrants. Never in the history of the world has a country been so inviting of new people, and from diverse backgrounds. Other nations are far more restrictive when it comes to immigration and the bestowal of citizenship. If you want to become a Swiss citizen, good luck. If you enter illegally into Mexico, you will suffer harsh penalties; it is a felony in that country. Yet those who push for ignoring our immigration laws spend all their energy attacking the United States as uncaring and tyrannical. Pure bunkum. For me, the common sense rationale for some type of immigration rules focuses first and foremost on national security. We need to know who is crossing the border. A porous border allows terrorists free access; a porous border permits a flood of drug dealers and other criminals to invade. How many deaths and other violent crimes are the result of our lax security? Yet many politicians, primarily of the Democrat stripe, show almost no concern for these threats. 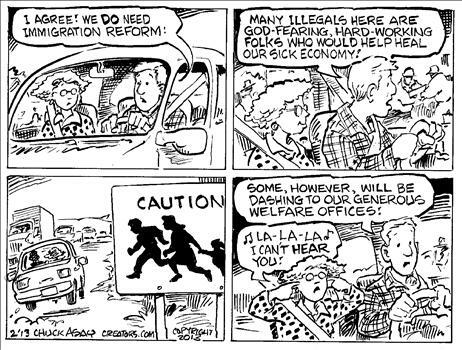 The politics of it is easy to understand: they hope to convert immigrants into citizens quickly, seeking to increase their voters. How do they know those immigrants will vote for them? Refer back to the previous cartoon. 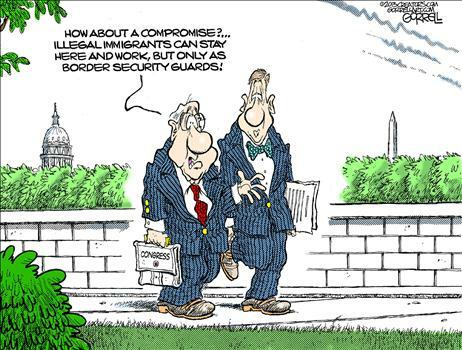 How’s this for a workable compromise? 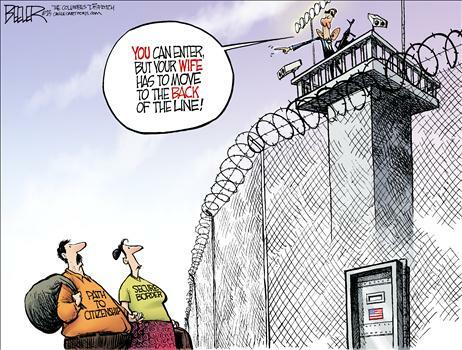 I’m not opposed to immigration reform, but it must be based on securing the borders first. Anything less than that is irresponsible. Anything less than that is another example of losing our minds.